Because many of you live in Southern California, you may quickly dismiss an article like this. I know what you're thinking. We don't have seasons and it's always 75 degrees and sunny. Well, there is some truth to that. But, did you know that our average temp is just a bit below 64 degrees? And from December to March, our low temperature is about 51 degrees on average. That may sound quite pleasant to our friends and family in much colder climates, but here in Southern California, that can be downright cold when you wake up in the morning and your previously warm and cozy feet make contact with that cold floor. Get ready for those chilly nights and have your furnace serviced now, before the overnight temperatures drop and you're scrambling to get an appointment with a furnace repair and maintenance company that is booked solid for the next month! When it’s cold, it’s easy to remember that the furnace is your friend. On winter nights, the convenience of pushing a button or dialing a knob to produce a comfortable climate is worth its weight in gold. But you can’t afford to consider your furnace only when you need it. For reliable service in season and out, you need to take care of your unit so it can take care of you. Warm Air Furnace: Warm air furnaces using gas, oil, or electricity for power are the most common types throughout the country. Old systems used gravity to distribute heat, but warm air systems installed after 1950 usually are power driven by blowers that evenly distribute heat. The attraction of warm air systems is that they are simple to install, service, and operate. Circulated air moves through a filter so that airborne dirt can be cleaned and heated before entering or reentering the home. The blower motor forces air through a heat exchanger and filter. 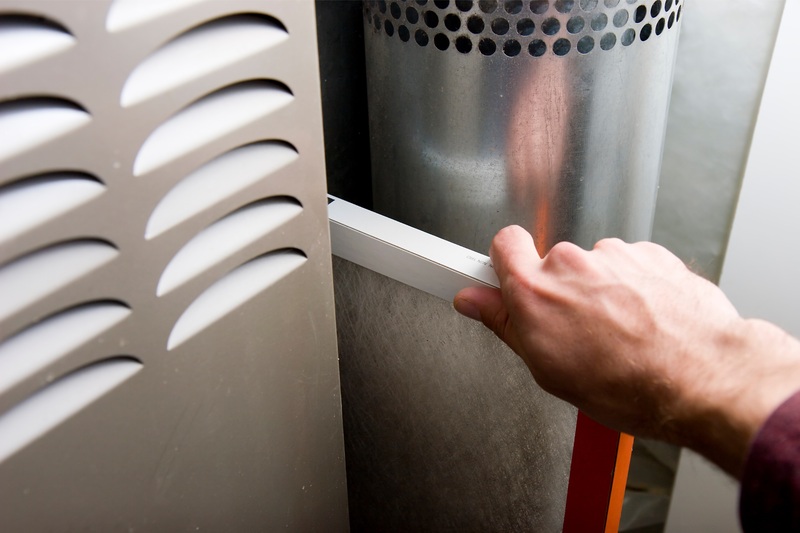 Once the circulated air reaches a predetermined temperature (set by the thermostat), the blower shuts off. Forced Air System: Forced air systems heat uniformly to the 110-degree range. These systems respond quickly to temperature changes, so it is advisable to leave the thermostat at one rate rather than making frequent manual adjustments. A well-designed forced air system will feature outside ducts, as well as high and low adjustable supply registers and a return register in each home. Combustion Air System: The combustion air system is one by which oxygen is delivered and gases are removed from the furnace in order to produce heat. Untrained service technicians may check the furnace but fail to check the entire combustion system. It is vital that they check everything, since a furnace of this type needs plenty of oxygen. In the absence of oxygen, a deadly, tasteless, colorless gas called carbon monoxide can accumulate. So be sure to inform technicians if your furnace is powered by an air combustion system. •Check the draft hood. This is the metal cover above the opening in the furnace. Make sure there are no signs of discoloration; remnants of soot, peeling paint, or animal hair; or dust and cobwebs. These items can clog up the system, resulting in higher than necessary energy bills. •Check the flue. The metal pipe that extends from the furnace to the chimney or vent also deserves your attention. Make sure there are no signs of deterioration. If you see white rings around the pipe, or if your fingers look brown after handling the pipes, you may have condensation build-up. Such excess moisture can lead to mold, a health hazard in any home. •Check the chimney. In older furnaces, venting can pose a problem. If you have a chimney, make sure there is no blockage. Even newer furnaces can develop problems. So pay attention to your chimney, whatever its age. Also, be sure to check for broken or crumbled mortar or bricks. These can also pose real problems. •Keep your blower motor oiled. If you see an oil cap when you check your furnace, be sure to keep it oiled. Easy to change and inexpensive to purchase, furnace oil keeps your furnace blower running efficiently. To change, just lift the cover and add a few drops of oil occasionally. Check the condition of the belt, too; it's inexpensive and easy to replace. Make sure your floor is dry. If you have standing water on the floor near your water heater or boiler, you may be in trouble. Also check to see if there is water in the site gauge. If the water level is too low, the unit will not fire properly. Never store things near your furnace or water heater. While it is ill advised to store anything near your furnace or water heater, it can be especially troublesome if those things are combustible. Watch your pilot light. If your pilot or gas burner produces a yellow flame, you may need to hire a contractor to make an adjustment. Yellow flames indicate improper combustion. Occasional orange-yellow or red streaks caused by airborne particles are acceptable and normal. Steady yellow flames are not. Know the danger signs of carbon monoxide poisoning. Get medical attention and call the gas company immediately if you suddenly develop any of the following symptoms: headache; tightness in the chest, forehead, temples; watering and burning of the eyes; weariness; weakness; dizziness; vomiting; and loss of muscular control. You may want to invest in a CO detector, which measures household levels of carbon monoxide.